However, things seem to be changing, with the introduction of new, modern buses in the kingdom that started trundling around at the beginning of February. Either because the buses’ bright red colour and LED displays notifying their destination are aggressively asking for attention, or simply because knowing about them meant I actually noticed them, they seem to be everywhere on the roads. Having never taken a bus in Bahrain before, largely due to lack of necessity rather than pandering to the warnings of ‘it’s dangerous for a Westerner to get a bus here’, or ‘they’re only for poor people, it’s offensive if you get the bus’ (yes, really), to the expectation of a long and delayed journey ultimately ending up at the wrong destination, I decided it was high time to put some of these myths to the test. What better time than catching the shiny, sparkling C5 from Budaiya Post Office to Manama Central Station and back? Parking at the post office, I was relieved to see the bus just up the road already there and raring to go, as the sun was beating down and any semblance of bus shelter had long since vanished. In fact, there was no indication at all, not even a sign, of where the bus stop actually was, so if it wasn’t already there I could have been looking in totally the wrong place. Luckily, the bus journey itself was much smoother. Greeted by friendly driver Faisal Mohammed’s smile, I paid my 200 fils fare and picked a comfy seat near the front to enjoy my journey. The days of engaging in fisticuffs with fellow pupils for the right to sit at the back and appear to be ‘cool’ are thankfully buried alongside throwing your pass out the window so your mates could use it and hammering the bell 100 times purely to ensure the driver knows you want to get off at the next stop in the dusty tome of ‘why high school kids are the vilest creatures on earth’. The seats are spongy, with ample legroom even for six-footers, and are currently really clean (although it remains to be seen how long this lasts). The bus itself has shiny surfaces and has plenty of standing room, with numerous handholds and a special cushion for disabled passengers meaning that there is a place for everyone, sitting or standing, to be comfortable. Technology has certainly advanced since the last time I regularly caught the bus home from school in the late 2000s, with a TV screen showing safety information and even Wi-Fi for passengers to use to pass the time. It did seem a bit gimmicky though, as the TV only flicked through about four repeating slides, so nothing a sign or a sticker couldn’t achieve. Showing route or timing information would have been far more useful. However, while the buses have been receiving praise, there are a few concerns with the scheduling and the overall efficiency of the operation. Moisas continued: “I get the bus to Isa Town and back every day. The schedule is very different from the old buses. The old buses themselves were terrible, really dreadful, but at least you knew they’d be there on time and would get you to work on time. After another passenger, who wished only to be known as Mohammed, confirmed these concerns and said that there was no customer service hotline if problems arose, and that the only point of contact with the bus company was an email address which he hasn’t had a reply back from for two weeks, I decided to bring it up with Customer Service Officer, Sayed Ahmed Sharaf, when I arrived at Manama Central Station. The 45 year-old said: “People have reacted very well to the service in terms of the buses themselves, but there have been a few problems with timings. The roads have lots of problems with traffic congestion and road works, which often spring up without any prior notice, so buses have to re-route and thus miss people and become very late. I must admit that this would be my primary concern if I was to be a regular bus-user. Including a 40-minute wait at Manama Central for the return bus, it took us nigh-on two-and-a-half hours to get from Budaiya to Manama and back, something which could be done in a quarter of the time in a car. The bus also seemed to stop at arbitrary places on the journey, with little to no signage denoting an actual bus stop. It seems you have to either get lucky with where it stops, or have the foreknowledge to know exactly where the bus stops are going to be. Back in my school days, you could usually tell what year a pupil was in by how far back on the bus they sat (tiny, timid Year 7s at the front, basically on the driver’s knee, and Year 11s at the back with their feet up, ties undone and shirt untucked), and if you weren’t in your designated year’s ‘section’, you received a death stare until you moved. I thought I’d avoid such treatment, now as a fully-fledged and mature adult (for some reason I can hear my colleagues in the office scoffing as I write this), but apparently I committed a major faux pas by sitting in the first two rows of seats. Supposedly, these are for women only, which I only discovered after I received a horrified look from a young Filipino lady and hastily relocated further back. Indeed, safe driving and a more comfortable experience seem to be top of the agenda. Charanjit Singh, 42, the station manager at Manama Central Station, believes that stricter training regimes will ensure standards will continue to increase. 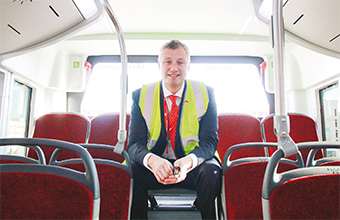 He said: “Customers have particularly praised how the drivers drive the bus. The old ones were sometimes accused of rash driving, but our new ones have been told to drive very safely and given notice that the safety of the customers is our absolute priority. “New routes are coming in on April 1, such as Manama to Riffa, and with this the Ministry also wants to build new shelters around the island, as the ones we have now are really derelict and old-fashioned. As the weather continues to get hotter, having a shaded area will make for a much more comfortable experience for passengers. While the new buses are certainly more appealing, it’s clear it’s a ‘work in progress’ if they are going to win over the hearts of businessmen and women, shoppers and their families. Why are all the stickers and signs inside the bus only in Arabic and Hindi? That’s hardly the way to attract Westerners to use public transport with the same frequency as in the UK and the US. Nevertheless, it was certainly a comfortable and safe ride. I can’t say it will become a regular staple of my morning rush to work, mainly due to not knowing where or at what time I’d finally end up at my destination, but I’d be more inclined to jump on a bus rather than pay through the teeth for a taxi than I was before.